A few years ago, [Brieuc]’s car blew a fuse. He went to replace it, which unfortunately means removing the entire glove box. In his haste to get his baby back on the road, he accidentally broke one of the clips that holds the glove box on the dashboard. [Brieuc] tried to just glue the thing back together, but it didn’t hold because the part has to flex a little bit for people who need to get into the fuse box. No one seems to offer a replacement for this small but vital hunk of plastic, though he did find someone offering total glove box replacements at highway robbery prices. Since there was still one good clip, he used it to design and print a strong ABS replacement. This is a great example of the one-off utility of 3D printers. 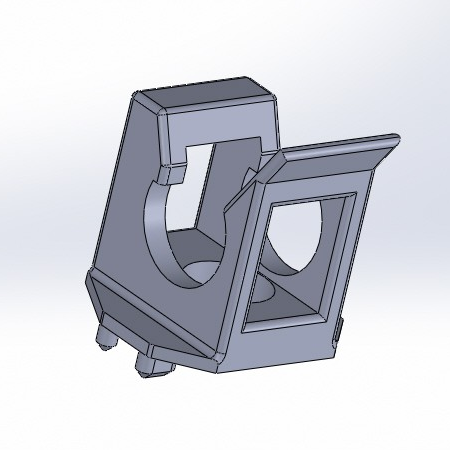 [Brieuc] didn’t need an exact copy, and since he was replacing an injection-molded part with additive manufacturing, he had the freedom to start with a bare-bones design, make adjustments as needed, and iterate until he got it right. It didn’t take long. The layer orientation of the first print made the legs too weak, but that’s a simple fix. The second version has lasted for three years and counting. We get it. You don’t have the same car as [Brieuc], so this particular fix doesn’t sway you. But someday in the future when your zipper breaks or your dishwasher detergent cup won’t latch, 3D printing will be there to help. Here’s an easy to follow guide for building your own glove box. It’s a lab tool that contains the project you’re working on to keep things in or out. For instance, we could have used this a few years back when we tried to add an acrylic window to a hard drive. Instead, we ended up putting several hours of work into a cool-looking paperweight. But it will also come in handy for chemistry experiments that generate harmful or dangerous byproducts. The picture above tells most of the story, but [Jason Poel Smith] does include several good tips about the construction in his video. He uses weather stripping along the edges of the clear container to ensure a seal. The hose is used to provide negative pressure so that no fumes leak out. We figure adding a smaller hole on the opposite side with a charcoal filter will help air pass into the chamber to serve as a fume extractor. We’ve already seen a similar setup for a reflow oven. Perhaps this is the perfect solution to protect yourself from 3D printing fumes. We’re sure you saw the headlines about 3D printing being as bad as smoking cigarettes. [KonaStar] shows us that adding some light to you car interior isn’t very hard. It’s just a matter finding some unused space and routing the cables so that they’re out of sight. 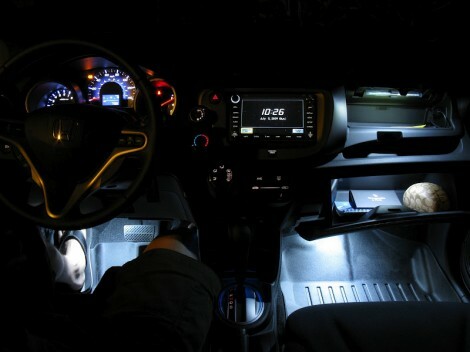 Here he’s added LED lighting to the footwells and glove box of his car. He managed to find some depressions in the molded dashboard of the car which were just the right size for a small four-lead LED. He drilled holes for those leads, and soldered some protoboard to them on the inside of the dash. This way there’s nothing unfinished to catch your eye, and the protoboard provides an area to host the resistor and interconnect. There are switches in the glove boxes that turn the lights off when closed. These work for the footwells too. In addition, the LED lighting harness is wired to the parking lights so they will not come on when the car’s lights are off. Because he started with a lighting harness intended to add ambient light to a vehicle, the system responds to the doors being opened as well. It’s a nice addition if you don’t mind pulling out several pieces of your interior during the install. We’re more comfortable with something along the lines of this turn signal hack.